Scales Used Over The iim7 Chord? 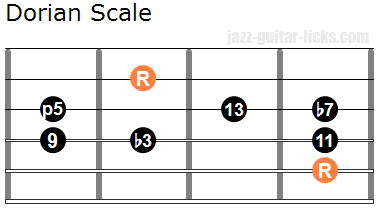 We have a choice of two minor scales to play over the ii chord. 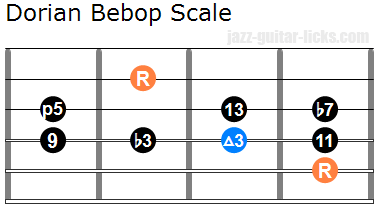 The Dorian scale (1 - 2 - b3 - 4 - 6 - b7), which is the second mode of the major scale, and the Dorian bebop scale (1 - 2 - b3 - 3 - 4 - 6 - b7) which is the Dorian scale with a supplementary note between the b3 and the 4. 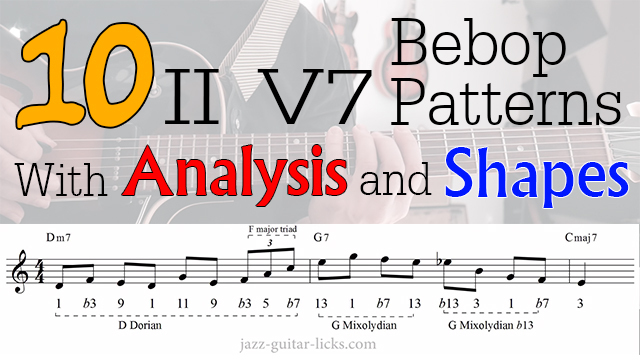 Let's start with the Mixolydian mode (1 - 2 - 3 - 4 - 5 - 6 - b7), the fifth mode of the major scale and the Dominant bebop scale (1 - 2 - 3 - 4 - 5 - 6 - b7 - 7) that contains a supplementary note, the major seventh (7) between the b7 and the root (1). 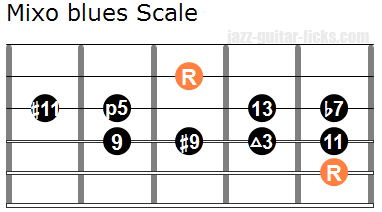 These two scales are the most obvious choice when you want to improvise over dominant 7 chords. 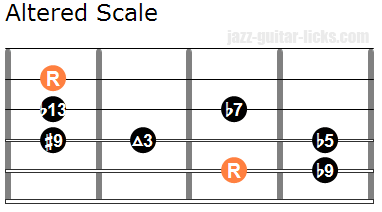 The four following scales will bring tension to your dominant lines. 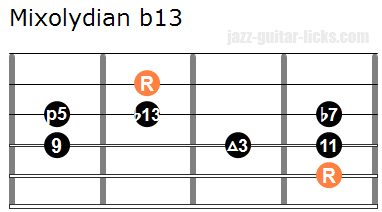 The Mixolydian b13 scale as its name implies is the Mixolydian mode with a b13. The formula is (1 - 2 - 3 - 4 - 5 -b6 - b7). 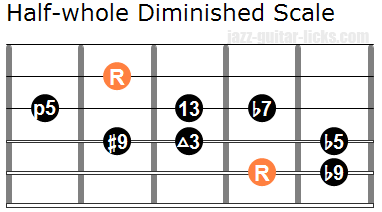 The dominant diminished scale (1 - b9 - #9 - 3 - b5(#11) - 5 - 13 - b7) is also known as half-whole diminished scale. This is a symmetric scale. 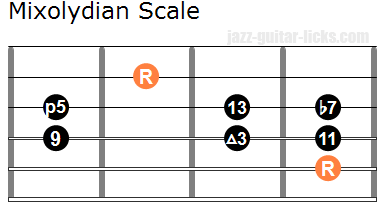 The altered scale (1 - b9 - #9 - 3 - b5 - b13 - b7) is the seventh mode of the melodic minor scale. The Mixo-blues scale, a mix of minor blue scale and Mixolydian mode (1 - 9 - #9 - 3 - 11 - #11 - 5 - 13 - b7), will bring a little touch of blues. Here are ten II V7 patterns using the scales previously seen. You can hear and see them in the video at the top of this lesson (please don't hesitate to like it, share it and subscribe to the YoutTube channel). It is strongly recommended to play these lines in twelve keys. 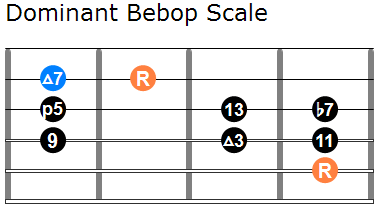 You can sing the chord tones (R - 3 - 5 - 7) while playing them. Don't forget that the ultime goal is to make is to play what you ear. These patterns are only used to build the basis of your improvisation. This youtube video lesson with score is about a jazz guitar duet in F taken from the book "A modern method for guitar" by William Leavitt. This music infographic provides the five main arpeggio shapes with intervals in there to play on guitar. These arpeggios are minor 7, major 7, dominant 7 , half-diminished and diminished 7. Check it out and share. Knowing how to play both the melody and the chords of a jazz standards on the guitar is one of the most important things for a jazz guitar student. This guitar lesson provides a YouTube video containing 5 famous jazz tunes with chord shapes arranged for chord-melody.